I remember her voice, her saris and the way she wore her long hair – tied loosely to cascade naturally. She was effective without affect. And her history class was a storyteller’s miracle! How every small detail, date, and dynasty intrigued me! How effortlessly characters, places, and kingdoms stepped out of history to animate the present. 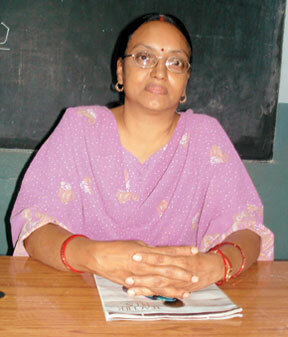 Mrs. Nutan Ranjan came into class one day, and life I think was a different story. Eleven years later, I was waiting at my old school to see her. I wasn’t sure if she was around but when someone told me she was, I walked the dirty Kanpur roads – a pedestrian’s nightmare, especially during monsoons – in the hope of being able to see her. Wondering if she’d recognise me, I gathered my thoughts and smiled at old school memories. Things had changed yet there was a familiar past lurking somewhere. She emerged from the class, and everything seemed just as it was, 11 years ago. A hug was all it took to reassure that nothing indeed had changed. We quickly found a corner in an empty classroom to sit and catch up on lost time. I: Ma’am, I work for a magazine called Teacher Plus and for the month of September, we are doing a special issue on remembering our teachers. So when I heard you were still in town, I just had to come and talk to you! Nutan Ranjan: Forget all that! First tell me how you’ve been? I was really curious about you but had no news. Tell me everything! I (smiling): Certainly! Well after I finished school, I moved to Delhi for a bachelors degree in financial management and then I got a masters in communication from the University of Hyderabad. Now I work for a magazine for school teachers called Teacher Plus. NR: I am glad that you’ve done so well. I: Thank you! So how has your experience been so far as a teacher? You see I have become a complete journalist type! NR (laughs): OK, please don’t write anything down. It’s been a satisfactory experience so far. I am not teaching social sciences any more. I am teaching English. I am comfortable here in this space. I: So I thought you had left the school? NR: Yes, I was going to but then I didn’t. I had settled down here and felt more at home. But I kept wondering about you. I asked some of your classmates about you as well. I: Oh, I just thought you weren’t around any more. And there was no other reason to come back and see the school. But have things changed here? NR: Yes they have! There is more awareness among students as to career options. Students from business-class families are considering leaving home and studying medicine, engineering, or business management. So that’s one big change. I: So you think students are better than they used to be? I remember my class being not particularly engaging. And there were only a few who were actually interested in exploring various options after school. NR: No, actually I don’t think that’s the case. I think they are still the same. And there are only one or two who are really interested. They come and talk to me after class sometimes. And I do give them my time. I: Oh just like I used to talk to you! NR: Yes exactly. I remember our conversations. And remember, I told you to take an aptitude test at that career center in Lucknow. I remember you had a flair for writing. I am glad you’ve pursued your interest. I: What else has changed? NR: Another difference is that old students care to keep in touch and come and meet me regularly. There is one student from your class who comes every Teachers Day to wish me. New students do not have the same feeling towards teachers. So I think I miss that about students. I: Anything else that bothers you? NR: I think what disturbs me the most is the trend of coaching. What we teach in class should suffice if students pay attention. But this whole coaching business is making them complacent. Also, teachers who offer coaching tend to favour their students in general in terms of evaluating their examination papers. I don’t think it’s ethical at all. It’s actually ruining the student’s capacity to think for themselves. And a lot of spoon-feeding happens in coaching classes so it inhibits their ability to think and apply their intelligence. I: That’s probably true! Are there any students in your present class who you’re happy with? NR: Yes, there are always one or two who are really good. And I work with them harder. But the rest of them just lack discipline and motivation. What usually happens is, those who come from families with private businesses get a lot of privileges like a motor-bike, mobile phone or large pocket money, do not really care about studies. But then, that’s how it is in most places I think. I: You know something funny? I changed schools after the tenth grade to go to a supposedly ‘better’ school. And upon being asked why I chose their school in the orientation class, my response was better discipline. And the whole class burst out laughing. NR (laughs): Yes, I think that’s not surprising. But I am glad that you chose to go out and do something on your own. I: Ma’am just one last question. Did you always want to be a teacher? If you weren’t one, what would you be? NR: Well, I wanted to do a masters in social work and I even got a seat at the Tata Institute of Social Sciences, but unfortunately I didn’t get the preferred specialisation. So I did a masters in sociology and followed it with a B.Ed. I just finished my masters in English recently. And I think I am happy with the choice I made. I: Thank you so much for talking to me. It was a real pleasure to meet after so long and we must stay in touch now. NR: Yes it was great to see you and I wish you all the best. And then we exchanged contact details and parted with another hug. I was sad to leave for the eleven-year gap could not be bridged in a twenty-minute conversation. But we are just a phone call away now. And that is the beautiful circularity of life anyway; to constantly go away and return! The author is a PhD student at the University of California at San Diego, USA. He can be reached at pawansinghh@gmail.com.